Spring has sprung! Well, sort of. Last month, when it was still technically winter, we had lovely weather and my five year old learned to make daisy chains on the grass outside school. Now though, despite the fact that it is officially spring, the rain is pouring down and all daisy chain making has been suspended. This is why we came up with a plan for daisy chains that you can make any time of year, rain or shine! It’s also a great project for preschoolers to practice some fine motor skills while having fun. 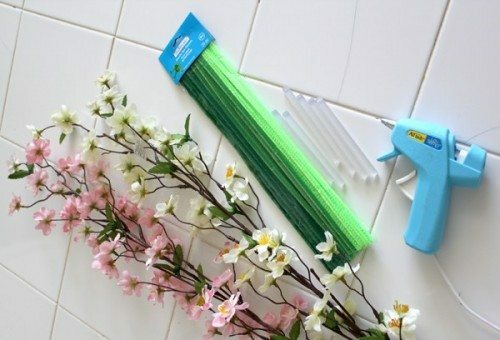 The supplies you will need are some green pipe cleaners and some artificial flowers. We chose some cherry blossoms because they were on sale and the daisies weren’t! You’ll also need a hot glue gun. Lastly, you’ll need maybe five or six random beads. 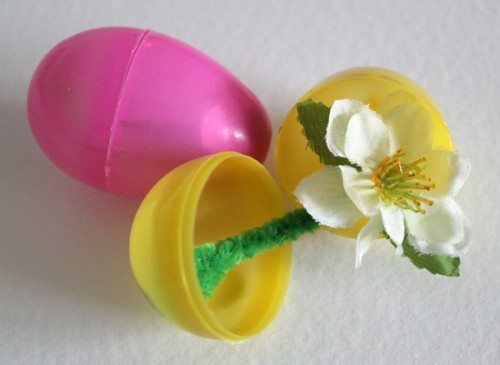 First off we chopped all the pipe cleaners in half, then pulled all the blossoms off their branches. Make sure that when you are choosing flowers for this that you get the kind that has a hole on the back where they fit onto the stems! 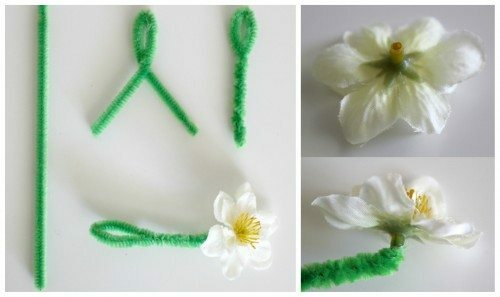 To make the flower sections, just take one of your half length pipe cleaners, bend it in half and leaving an open gap, or loop at the bottom end, twist the two halves together. 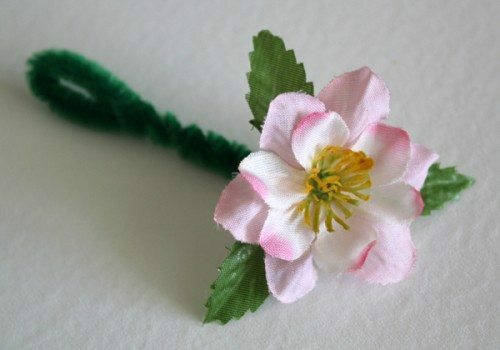 Dab a blob of hot glue onto the open hole part at the back of the flower and push the two twisted together ends of the pipe cleaner into the hole. 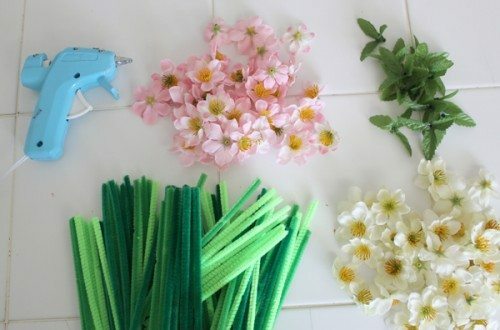 The glue sticks really well to the fluff of the pipe cleaner, meaning these won’t fall apart easily when kids play with them, plus the sharp ends of the pipe cleaners are all tucked away into the flower head. The way that the chains join together is using a hook that you start each chain with. 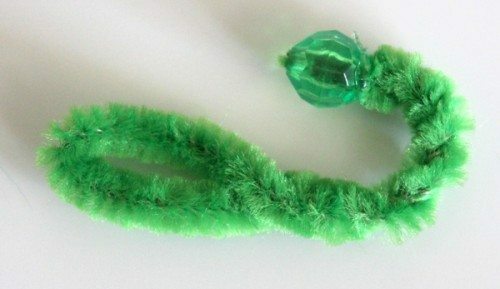 I made the hooks in the same way that I made the flowers, but instead of gluing a flower onto the sharp ends of the pipe cleaner, I glued on a bead and then bent the pipe cleaner into the hook shape. Here you can see how they thread together easily and how the hook works to close the chain. From the materials we started out with, we were able to make approximately 80 flowers (half white and half pink), plus 12 hooks. 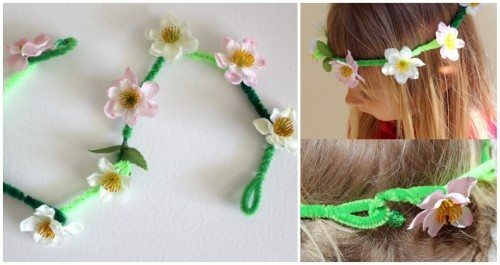 It takes ten or eleven flowers to make a single headdress, so with this amount the kids can make several, or make necklaces and bracelets to go with them, or just make a massive chain that is a few meters long to decorate with. 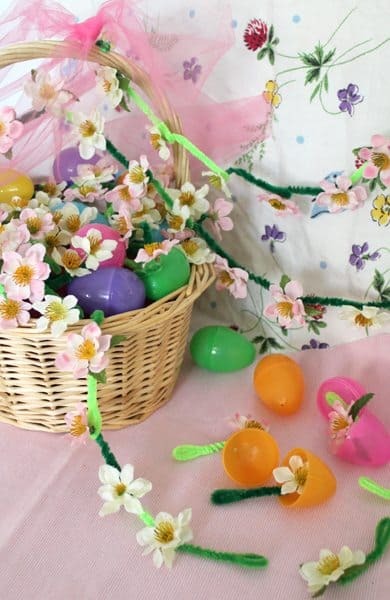 The other nice thing about these is that they fit really neatly into a plastic Easter egg, so if you want to have a candy free egg hunt, some of these would work well for kids to find a collection that they can then build their own headdress or necklace from. 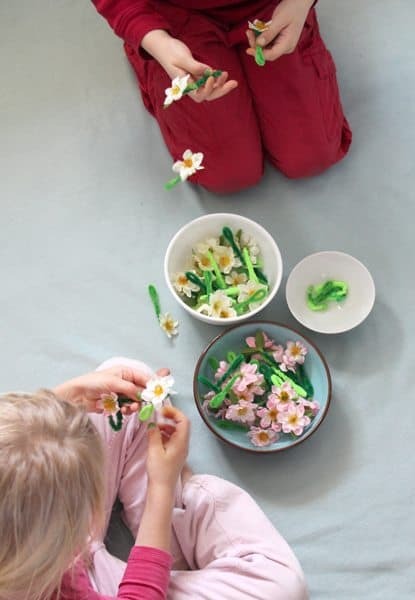 So, when the April showers hit and you’re done with stomping in puddles, just pull out a green blanket and your all weather daisy chain kit and pretend you’re in a sunny meadow. Ideal for an indoor picnic! trés jolie!! trés bell idée!!! !je ferai avec mes enfants ! merci a vous j’adore de vos idées ! !